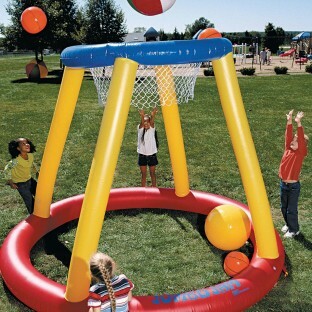 8 Foot High Inflatable Basketball Goal. 4 Foot Hoop with Nylon Net. Huge 10 Foot Diameter Base. Aim for exciting new heights of fun indoors or out with our incredible, colossal Jumbo Jam™! This inflatable, heavy-duty vinyl basketball goal measures an amazing 8'H with a 4'-diameter hoop and nylon net. Great for large groups – the huge 10'-diameter base gives kids lots of room to practice their shooting skills. Use as a lead up to basketball or create original new games just for FUN! The base ring includes4 anchor points so it can be staked into the ground (4 tent stakes included). To inflate this item and other large inflatables a pump that generates a high volume of air like our W5970, W2407, or W10698 is recommended. A standard high pressure pump used for tires and sports balls may work, but it could take up to 2 hours to fill and that type of inflator should be monitored to make sure it does not overheat. We use this product for our Super Kids Day. Our kids love it. We have ordered several.Only problem is that it has sometimes come with small pin holes in parts of it and the patches don't work leaving it useless. SS has always replaced any that came that way. We used the Jumbo Jam in a kid area for a city family event. The 5 - 7 year old's enjoyed making baskets while the 4 and under group like playing with the beach balls in the bottom of the basket. It was a wonderful addition for our family event. Using this for kids activities in our campground. I purchased this many years ago and it is still going strong high quality vinyl. I use it indoors with about 30 beach balls of various sizes. The kids have a blast rapid firing shots at the net. Never tried it outdoors though it may have a tendency to blow over. INDOORS IT IS GREAT! This item does not stand up on it's own nor do the stakes that come with it help keep it up. It was a complete waste of money. Merchant response: Thank you for your comments. This item has a two piece valve. For a proper seal, make sure to put in the plug and then screw on the cap to secure the plug in place. Without using the plug, air leak and the item will deflate fairly quickly.